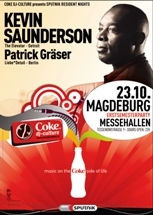 Tonight, me and my mate Patrick Gräser will play in Magdeburg to a big student party crowd. Come around if you’re there, we’ll see what the young folks think about my bass monsters. Find more Dj mixes by Patrick Gräser. On friday, I’ll play at a private party at Pan Am Lounge – this will be fun, too! Pan Am Lounge is the place where pilots and other employees of Pan America Airlines used to hang out in the sixties and seventies. And it looks exactly like that.